About it researchers from Durham University have told in the scientific work, published in the journal The Astrophysical Journal . All planets of the Solar System are more or less oriented in the same way as the Sun, while the North and South are determined in one direction. But not Uranus The blue planet from the north to the south leans 98 degrees from the orbital plane of the Sun. The axis of rotation of Uranus is as if on the side relative to the plane of rotation around the Sun. As a result, the planet is invisible to the Sun by the northern pole, then the southern, then the equator, then the average latitudes. In addition to the strange orbit and unusual rotation of Uranus, the planet is the coldest in the solar system, although it is closer to the Sun Neptune. "Uranus is on its side, and its axis of rotation is inclined almost at right angles to the axes of other planets in the solar system. It is almost entirely confident that this is a consequence of a giant collision, but we are very little aware of exactly how this actually happened, and how such a catastrophic event has affected the planet, "said Dr Jacob Kegerreis, research director. Scientists modeled more than 50 different collision scenarios, which showed further events on the planet. 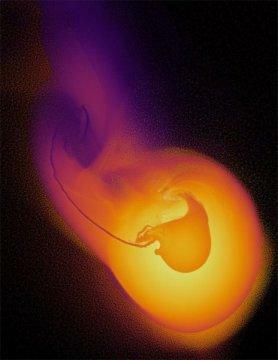 The main version was the collision of a young Uranus with an icy object, which twice as much mass as Earth. At the same time, the collision was frontal - the protoplanet only touched Uranus sideways, accelerating its rotation. In addition, the rings and satellites of Uranus may be planet particles that are split during a collision. -The event, probably, occurred about 4 billion years ago in the early stages of the solar system. -Previously, astronomers discovered in a 12 billion light-years of a supermassive black hole , which every two days absorbs mass of mass equivalent to the mass of the Sun. -Scientists say they have found evidence of the existence of water geysers on the smallest of the four largest satellites of Jupiter, called Galilean - Europe. -Find out how it's going to fly through the Orion Nebula . Astronomers and NASA visualization specialists combined data from the Hubble and Spitzer space telescopes (visible and infrared ranges) and created a video of such a flight. -Astronomers from the University of Crete created a three-dimensional model of the Muska Cloud, located 500 miles from Earth. -An international group of astronomers has discovered a merger of 14 colliding galaxies and eventually can form the most powerful object in the known universe. -The European Space Agency has released the largest stellar map in the history of astronomy. Banner Rotation is not appearing...?